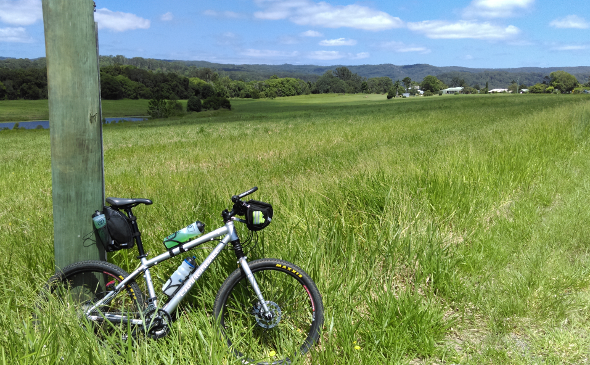 Today, after much anticipation, I was heading to Nambour from Brisbane to begin a bike journey which would ultimately end at the town of Rainbow Beach at the very northern part of Queensland’s Sunshine Coast. I would pass through arguably some of the most picturesque hinterland, state forest beaches in Queensland along the way and cover about 120km on this single day journey. My old 26inch wheeled Cannondale F4 was prepared the night before so theoretically there would be nothing more to do except jump on and roll down to the train station but there was always that one forgotten item. My tardiness had afforded me another opportunity to check. A set of tried and tested Maxxis Crossmarks hugged the rims of the old nine speed triple Sram endowed steed. A very oversized saddle bag oozed down about half the length of the seatpost while, at the front, a handlebar bag sat above the old ‘Dale’s Headshock Fatty. The handlebars were adorned with a set of long nineties style bar ends and the top tube sported an extra bottle cage shielded from the frame by a piece of inner tube and fastened with zip ties because the frame has but one set of bottle cage bosses. What a magnificent hack and what a fabulous machine for the adventure that lay ahead. A lot of people would have chosen a plus sized mountain bike or fat bike for this journey which I guess makes sense given the kind of terrain I’d be covering but I’m at a stage with my cycling where my inner churl is really beginning to blossom and the urge to flip the bird in the face of fashion and/or good advice often takes over. Well, that and the fact this was the only bike I had at the time which was even close to being suitable for the trip. And so I departed from my north bound Brisbane station changing trains at Caboolture where I upgraded to an older but much more comfortable Sunshine Coast train. The seating on the Nambour bound train was in a different class with it’s high back airplane-like seats. With my steed securely fastened to a hand railing courtesy of a velcro high-viz ankle strap, I watched the hinterland meander past almost falling asleep as I drew ever closer to the start of my adventure. Arriving at Nambour at about 9am, I stopped for a quick coffee and a bite and headed out of town. The road went from four busy lanes to two and the traffic thinned out to almost nothing. Passing by rural properties – some with small collections of livestock, others fronted by crop fields – I headed toward the Eumundi Conservation Park. After a short detour due to roadworks, I found myself in the heart of the conservation park. The landscape changed from dry sclerophyll to swampy rainforest and back again within a few kilometres and I had the place mostly to myself except for a few walkers and a horse rider. The day was getting on though and the temperature was now nudging thirty degrees Celsius. Just as I began to worry that maybe this crossing of the conservation park was taking too long and that I might be lost, I finally popped out of the forest an onto the Eumundi-Noosa Rd. Although the heat was now a little bothersome, my spirits were high and after a short rest I pointed my rig towards Tewantin. I eventually arrived at a roadhouse in the tiny location of Doonan where I bought several litres of water to replenish my supply and body. Rejuvenated, I continued on to Tewantin making good headway. But just a few short kilometres from my next destination, I felt the disappointing sag of a puncture in my back tyre and it was off onto the grassy road shoulder to find a tree for some shade to make the repair. 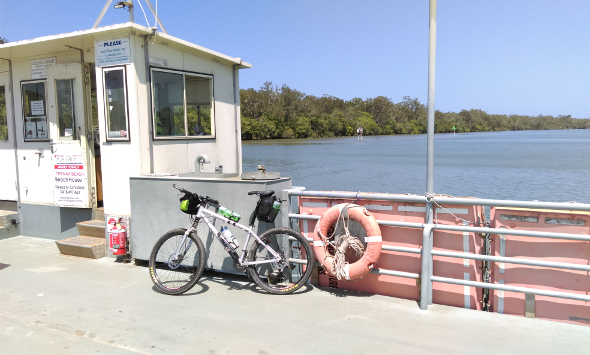 Soon after I arrived at the busy little town of Tewantin on the banks of the Noosa River where lunch awaited at one of the many cafes and after refuelling, I headed on to the Noosa River crossing where the vehicle ferry awaited. Being far more accustomed to getting four wheel drives across the river, the operator looked as though he wasn’t sure what to make of me and my bike but a couple of gold coins got me across for the next leg of my journey. It was after 1pm by the time I hit the sand at the cutting to get me onto the beach at Noosa North Shore. The thought crossed my mind that I had left it too late to make the 35km journey to the start of the Freshwater Track and the 20km or so to Rainbow Beach from there but my pace up to this point gave me reassurance that all would be well. I was very quickly left in doubt again – the headwind on the beach immediately began to take it’s toll. Five kilometer stints at about 14km/h with a pause in between to stretch the glutes and quads was the only way to go. 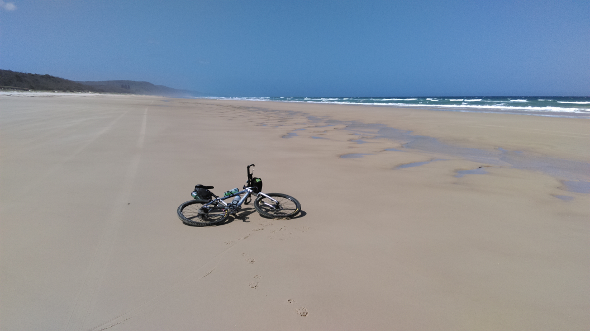 The tide was low and I picked my way along the hardest section of sand which gave about as much rolling resistance to the tyres as a reasonable quality dirt road (but with a constant 15-20 knot headwind). The headwind and the disappearing day were some of the things to worry about. The other was the thin but steady flow of four wheel drive vehicles coming toward me and passing from behind. They were all very courteous though and one couple even stopped and offered to top up my water bottles which I graciously accepted. After what seemed like too many five kilometre stints, I finally spotted what I was waiting to see in the distance – four wheel drives getting the long run ups required to cross the cutting into the Freshwater track. Upon arrival, I rode as far as I could up the cutting and pushed my bike the rest of the way up to the camp ground. I asked a group of young guys setting up their campsite for the night where the entrance to the Freshwater track. They were amazed to hear that I had ridden from Nambour – the same place they had come from – and was still carrying on to Rainbow Beach. Starting through the freshwater track, the going was tough with walking the bike through soft sand being the norm until I got to the western side of the dunes where I was able to make good headway along the solid ground. By the time that happened, it was pitch black and my USB headlamp was the only sign of any human life which on first thought was disconcerting to someone who lives in a densely populated area but my rational mind quickly told me that if things turned bad, I was now not very far from the main road. With light being a scarce resource, insects quickly found my presence. The most interesting were the gigantic rain moths which are roughly the size of a sparrow. The first one of those that dived at my light certainly had me thinking about alien air raids and the like. When I finally reached the intersection of Rainbow Beach Road about 4km out of town, I had almost reached the point of exhaustion and my food and drink supplies were getting very low. I was running on pure adrenaline now and the undulating black ribbon seemed to carry me into town like a magic carpet. I had made it. Food, a bed and a shower awaited me in a pre-booked resort room at Rainbow Beach where I would stay for a few days to enjoy the incredible beaches and views before catching a lift back to Brisbane. Despite the hardships, the ride was extremely rewarding and I recommend it to anyone looking for a challenge. I highly recommend taking a decent stash of food and as much water as you can carry for the beach and Freshwater Track sections and your fitness level should be above average before you attempt this ride. You’ll also need to pick the low tide to get along the beach and remember to let someone know where you are because you will be out of mobile phone range and quite a long way from any real help. Keep in mind also that the salt and sand encountered on this trip can wreak havoc with your bike components if left unwashed so make sure you give the ‘ol whip a good hose down with plenty of fresh water after the ride.